I'm having a change of heart over the transition from TransLink to Clipper. In mid February, the Complaint Department posted an entry asking for people to suggest a better name than Clipper while also suggesting that there's no real need to re-brand. On one end, I was a little ticked that millions were to be spent on re-branding the program while others have argued the current name (TransLink) works perfectly fine. Here's some suggestions that I gave: The Bay Area Card, Sea Lion Card, and the Crab Card. Well... the Crab Card reminds people about our famous crab (Crazy Crab? ), but might also remind people to check for STDs. One of the big arguments MTC made about the name change is the name TransLink is used too often around the world, many transit agencies use this name for their trains and buses, and in Australia, they have a similar RFID card known as the "TransLink Go Card." But here's why I have switched gears and now in favor of a name change: TransLink in Vancouver (Canada) has recently announced their intentions to create a new transit smart card. While there is no official name out, many Canadian Twitter users are identifying as the "TransLink card" which totally screws up my search results on my 3rd party Twitter based programs like HootSuite. That news release is the big nail in the coffin for the SF Bay Area's green colored card. 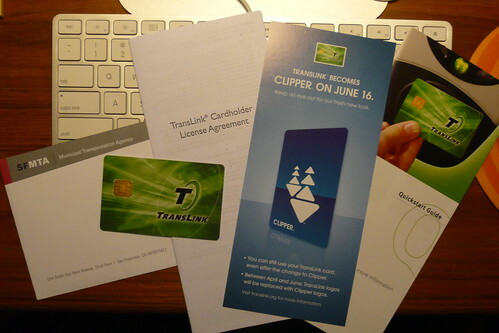 While we are 16 days until the official first day of Clipper and their new cards (June 16th), you can still grab yourself a relic souvenir of the green TransLink card before they disappear forever. They are just $5 at participating retailers, or you might get lucky and score a free one from the TransLink crew wearing green t-shirts at random major Muni bus stops and metro stations around the city. I wonder if I need to retake all my TransLink card photos (Flickr) and videos (YouTube), and replace them with Clipper card usage? That will be a challenge.